At work recently I walked in to a name I recognized, a face I recognized but I couldn’t put the two together. If I’ve had a busy few weeks this isn’t uncommon. Client after client with back pain or some issue starts to blend particularly if we’ve not had extensive conversation that allows me to get to know the person I’ve worked on. When I said hello the client they looked at me fondly and said, “the new love of my life.” I blushed lightly, looked at my boss and she said, “I think she likes your work Robert.” I giggled and mentioning it to my boss later and she said I’d be surprised how many marriage proposals she’s gotten over the years. 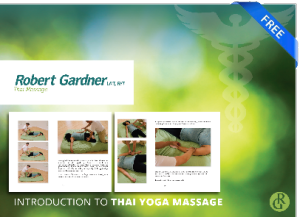 Talking with the client afterwards, it turns out I’d done what for me is fairly standard, Thai massage or as some call it Thai Yoga massage on the table with a new client. She’d been having low back problems and the work is so beneficial it’s my go to in the tool box. Discussing her pain scale she explained to me that if 10 meant you were going to the hospital and 0 was no pain she was at about a 7 when she saw me. The following morning she felt like she was under a 1. That much pain relief will get you some loves. She’d read some of the blog here, purchased a Ma roller and told all her friends. I adore having honest expressions of appreciation but other than a nice tip after your session nothing spells appreciation like referrals. In the business of bodywork I don’t find that ads draw people in. Much like a hairdresser there is something intimate about working with someone, one on one, on their body in some caring way. Most people ask other people who they go to. They don’t as commonly look up random names in a phone book like they would for plumber. Another thing that impressed me about the interaction with the client is they were engaged in their healing process. Not only did they make a semi-regular appointment for several weeks but they purchased the massage tool the Ma roller to engage in self care. The work we do is healing and in a culture with a lack of physical touch just that alone is therapeutic to people. The best care is active and passive, from working on yourself and from allowing others to help you. Nothing in my experience is as healing as your own focus and care then allowing a nurturing therapist to assist you in that healing process. It’s far better than just working on yourself. You’re not alone in your quest. Tips are another area that spell appreciation. When a tank of gas costs $50+ these days it makes an impression not only financially but energetically. The fact that a client gives me more than the asking price tells me they value our time and interaction enough to want to keep me around. If you worked in a restaurant do you remember the patrons who tip well? Same if you’re a bartender? One thing I learned long ago if I was drinking hard liquor the bartender got a large tip right up front. The following drinks were always a little better. Another factor to consider is regular sessions with a therapist. Regular work for a massage therapist is golden. We work in an industry that isn’t often stable. Work comes and goes, paychecks fluctuate and clients that get regular work make our income more balanced and our work go farther. Clients who engage in regular work respond better, their tissues soften and it shows they’re being proactive with their health. After ten years working nothing is quite as irksome as someone who comes in with the code red crick in the neck. That didn’t happen over night, it usually happens over the course of months of lack of exercise, lack of care and now they come in for me to fix it. A regular client who comes in gets far more empathy when it comes to the ups and downs of life and limb. So the appreciation goes both ways. If you’re a client or student who sends friends, thank you. You’ve made my healing work possible. If you tip and help me pay for gas and groceries thank you as well. Without you I’d be working as a plumber in a far less fun environment. Looking Back #2 What do you teach?